I cannot print/download your files properly. What's wrong? This is great stuff. Do you have more? No. All of the music I have is posted already. I am looking for piece X for ensemble Y in the key of Z minor. Can you arrange that for me? Not for free. The purpose of freegigmusic is to provide a foundation for as many musicians worldwide as possible. Essentially, the site is geared to serve the basic needs of a wide audience: to give people a starting point -- and they can go from there. I simply cannot tailor every instrumentation to every need. And as this site is for public use, I cannot process such individual requests, which require a personalized service. In the past, I have had the occassional user who would simply pay me for creating a specific arrangement tailored to their own individual needs. This is, of course, just an option, but if it sounds like something that might be of interest to you, feel free to contact me. My son/daughter wants to use your arrangements for a competition at school. Is that okay? You are welcome to use the music in any competition you like. However, you may wish to check the rules for the competition itself: some of them limit selections to those available through brick-and-mortar publishers, while the sheet music on this site is available online only. But I am happy to give permission for use of the arrangements on this site for such a purpose. Can you send me Sibelius/MusicXML files of your arrangements? For a number of reasons, I do not send out Sibelius or MusicXML files under any circumstances. In the past, you had arrangements for three violins and cello. What happened to those? Due to a number of complications, these selections have been removed from the main area of the site. However, as I still receive occassional requests for this music, I have made the discontinued arrangements available in a zip file, which you can download here. Feel free to use them as much as you like, so long as it is for your own personal use to study and perform (i.e. do not sell it or post it online anywhere else). That said, enjoy your music! Is this legal? What about copyright? Yes, it is legal. The music on this site is all in the public domain, and it was all was arranged from public domain sources: editions published prior to 1923. Please note that the information above is in accordance with US copyright laws and practice. These matters vary internationally, so if you live elsewhere, please check the copyright laws of your country before using the music on this site. Free Gig Music does not assume any sort of legal responsibility or liability for the consequences of downloading files that are not in the public domain in your country. Then why is there a copyright symbol on the music? I hold a copyright to the arrangements of the pieces on this site, not to the original music itself. Did you do all of the arrangements? So am I allowed to use your sheet music? Yes, I hereby grant unlimited permission to print and perform all the sheet music found on this site. Why don't you have any popular/modern songs? Anything published after 1923, and still popular, is probably under copyright. I do not have permission to use it. How do you make the music? I arrange it using "Sibelius", and then print and process PDF files using "CutePDF Writer" and "PDF Split and Merge". The latter two are both available for free on the internet (just google the names). How did you learn to build websites? I went to Barnes & Noble and bought a book on HTML. 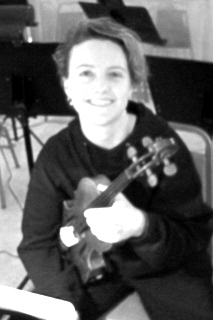 Just another violinist :-) I got a Bachelor's degree in Violin Performance from the University of Cincinnati College-Conservatory of Music, and I now freelance in northeastern Ohio—and beyond, if the opportunity arises! Among other things, I am actively involved in my family's opera company, Opera Circle: visit us at www.operacircle.org if you wish! I was born in Warsaw, Poland, and moved to the US when I was eight years old.